Allegheny General Hospital, part of Allegheny Health Network, has been named one of 30 National Pancreas Foundation Centers across the United States recognized for superior treatment of pancreatitis. It’s gratifying to be ranked among the nation’s best centers by an organization that does so much to educate and advocate on behalf of patients with pancreatic disorders. NPF Centers are at premier healthcare facilities that focus on multidisciplinary treatment of pancreatitis, treating the “whole patient” with a focus on the best possible outcomes and an improved quality of life. The NPF Centers designation was created to promote consistency in the treatment of pancreatitis and other pancreatic disorders and guide patients to facilities that offer high quality care. Designated centers will also seek to advance research and lead the way for heightened awareness and understanding of pancreatitis and related conditions among community physicians, allied health professionals, patients, families and the general public. Approved NPF Centers had to go through an extensive auditing process and meet criteria that were developed by a task force made up of invited subject matter experts and patient advocates. The criteria includes having the required expert physician specialties such as gastroenterologists, pancreas surgeons, and interventional radiologists, along with more patient focused programs such as a pain management service, psychosocial support and more. AHN gastroenterology faculty who provide specialized pancreatic care include Shyam Thakkar, MD; Abhijit Kulkarni, MD; Katie Farah, MD; Manish Dhawan, MD; Robert Kania, MD; Suzanne Morrissey, MD; Marcie Mitre, MD; Pikul Patel, MD; and Deepti Dhavaleshwar, MD. Pancreatic surgeon Donald Atkinson, MD and pancreas transplant suregeon Ngoc Thai, MD provide specialized surgical treatment. The Allegheny Center for Digestive Health has a longstanding reputation for providing top quality care for patients with disorders of the pancreas, liver, and gastrointestinal tract. Gastroenterologists, hepatologists, colorectal surgeons, bariatric surgeons, gastroenterology nurses, dietitians, integrated medicine providers, pyschologists and other specialists evaluate and treat patients as a team, resulting in seamless care designed to meet all of the patient’s needs. 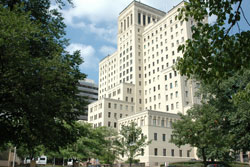 In addition, the Transplant Institute at Allegheny General Hospital provides unparalleled expertise for patients requiring pancreas transplant and boasts the best outcomes in the region across most of its transplant programs, according to the Scientific Registry of Transplant Recipients and CareChex®, a division of Comparion Medical Analytics. Founded in 1997, the National Pancreas Foundation is the only foundation dedicated to supporting patients suffering from all forms of pancreas disease through funding research, advocating for new and better therapies and providing education for patients, caregivers and health professionals. For more information or a full listing of the NPF Centers criteria visit: http://www.pancreasfoundation.org.